Oh hello, beauties! How are you coping with your first day back after such a long break? It’s a struggle! Hopefully, today’s post will perk you up a little bit, especially if you’re a skincare junkie like me. If you read my last post (here) you would have seen that I went to Barcelona for my birthday. I decided to take the travel sized Caudalie products I bought last Christmas (here). 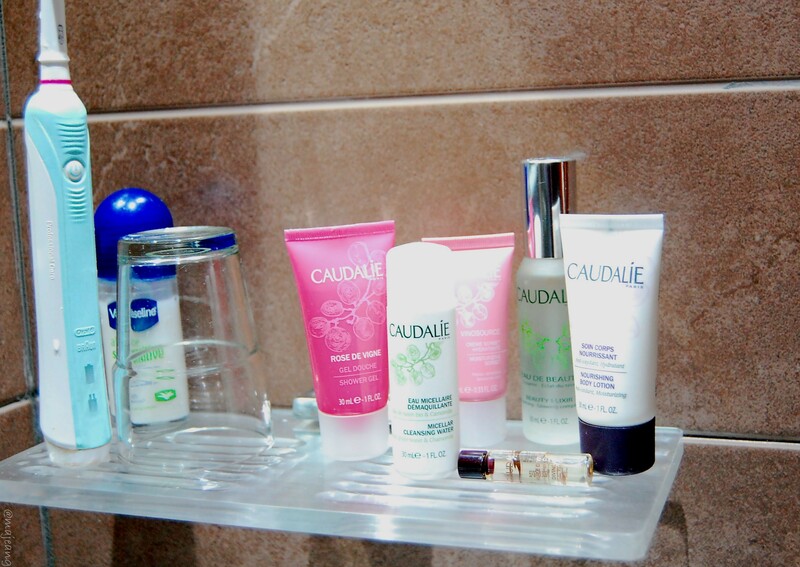 So let’s get into my thoughts of travelling with Caudalie. The case comes with a Micellar cleansing water, Vinosource moisturising sorbet, Rose des Vignes shower gel, Nourishing body lotion, Divine oil and the gentle conditioning shampoo, which I didn’t use. I also took with me the Caudalie Elixer, that I purchased separately. To me, that’s a good amount of products for £12.50 from LookFantastic . I love the Micellar cleansing water because it took off all my makeup and didn’t strip my skin. It actually felt soft, which I know sounds really strange but that’s the best way I can describe it. The moisturising sorbet, I was excited to use because when I think of a sorbet, I think light and easily absorbed. It did do that but, I didn’t like the smell. It reminded me a bit of tree bark and not necessarily in a good way, however, to be fair the smell didn’t linger at all. My favourite product I saved for last and that was the divine oil. Oh! how I loved using this little vial of magic! I completely forgot to pack moisturiser for my hair and a comb! Shock horror! But this oil saved my locks. I even used it on the back of my heels, elbows or anywhere that needed some added moisture. It didn’t clog pores, nor did it leave a greasy film. Might need to invest in a bigger size. This was the best purchase I’ve made. The price point is great and you get a lot of products which are easy to use. I can’t comment on the shampoo but if I ever use it, I will let you know. Essentially, travelling with Caudalie is luxury whilst on the road and when I finish with this set, I will definitely re-purchase. Have you purchased this travel set before? Let me know in the comments below! As always, thank you for reading and be sure to subscribe for more!